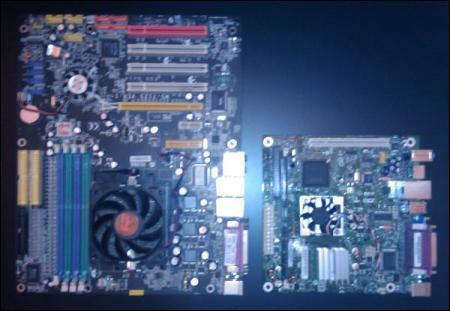 The old AMD socket 939 motherboard that my Ubuntu Linux file server was running on finally gave up the ghost last week. Because replacements are harder to find for older processors, I decided to try a different router and went with an Intel mini ITX motherboard and Atom 330 processor. 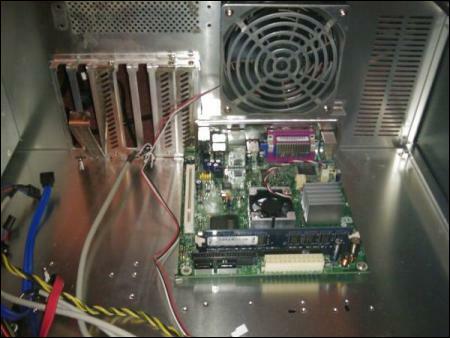 What’s neat is that the heat sink with the fan isn’t cooling the processor, but the northbridge chipset. The actual Atom 330 processor is underneath the fanless heatsink next to it, which tells you just how little power it’s using in comparison. It’s amazing how small this little guy is, especially when compared to the motherboard it’s going to replace. I’d almost go as far as calling it “Mac mini” small. It’s pretty comical to see how much space there is surrounding it in the Rocketfish tower case I had for the box. So far performance has been good, both from a file serving perspective, as well as trying out general desktop performance under Ubuntu.